Today we are in Marmirolo, in the locality of Belbrolo to be precise, set in the Permanent Meadows area. 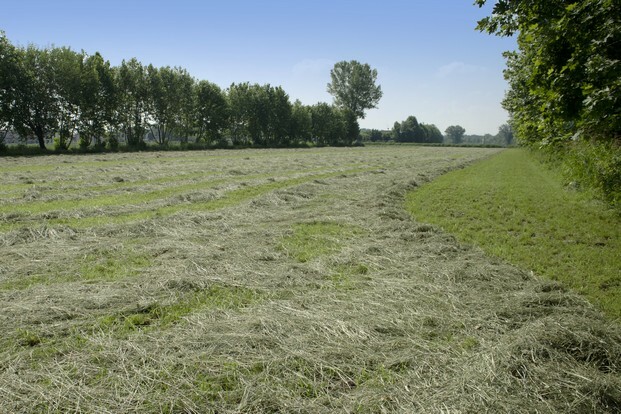 Giuseppe Priori, the President of the Latteria Agricola dairy, emphasises the permanent nature of the meadows. These grasslands are a historical part of the land, where they grow spontaneously and without any particular requirements. They are managed naturally using gravity fed irrigation and are regularly fertilized with natural slurry and then mowed. The resulting biodiversity creates a balanced and complete forage with different nutritional properties, which gives the milk, and consequently the cheese, distinctive organoleptic and nutritional characteristics. Permanent meadows also enable farmers to devote more time to their cattle, thereby improving animal welfare. 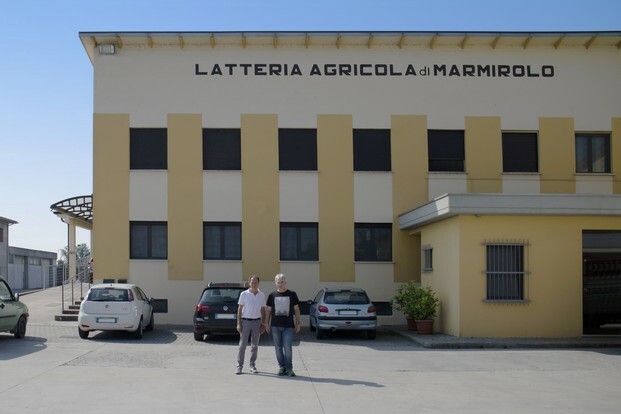 Giuseppe now has to go off and work in his permanent meadows, so he says good-bye and leaves us in the company of “Ragio”, a key figure in the dairy who has lived through its history: Giuseppe Zavatta. He tells us that the date of dairy's deed of incorporation is Christmas Eve, 1966. This was a god omen as construction work soon began and Grana Padano production finally started in 1970. The dairy has only ever produced this particular cheese. In line with the trend in other dairies, at the beginning there were many farms supplying small amounts of milk then over the years they decreased in number while milk production increased considerably. In the old days the work was much harder because the milk was collected in iron milk churns. They weighed a ton when they were empty, so one can just imagine their weight when they were full. The milk collector did two collection rounds, one at night and one in the early afternoon. He always brought his little notebooks with him. These were logbooks in which the quantities of milk collected were entered by hand. A copy of the logbook stayed with the milk producer and one was kept at the dairy. Of course in those days there were neither computers nor management software, so while things were definitely complicated for those who made the cheese, the administration work was also no easy task. Delivery notes, accounting books, everything was paper based. Although they would try to find ways to simplify things, what today's accountant Enzo can do in 10 minutes could take Giuseppe as long as half day. In addition to the milk delivery and cheese production records, Ragio also oversaw the administration of the pig farm, which was a large-scale undertaking and kept going for many years. The pigs were fed the whey left over from the Grana Padano production process; it was a great nutrition boost to the pigs but also made it easier for the dairy as they didn't have to worry about disposing of this product. The pig farm has now been sold and the whey itself is sold to make other kinds of products. Giuseppe also managed the books of the feed mill that was set up in the 80s and kept going for about fifteen years. “Mr. Gaburri, who was the president at the time, had decided to start this business to provide a service to the dairy farmers in the cooperative.” They would buy the raw materials, like maize, wheat, bran, soybean meal, mineral supplements, alfalfa, and so on, and make a customized feed for every milk supplier. An agronomist would go and visit the dairy farms and determine the needs of the cattle, and each farm had its own recipe for a suitable diet. Whenever they needed it, the dairy farmers would ring up Giuseppe and request a supply of feed which would be delivered in bulk by a tank truck. The feed came complete with a label, initially hand-written, with all the explanatory information as well as the packing and use by date. 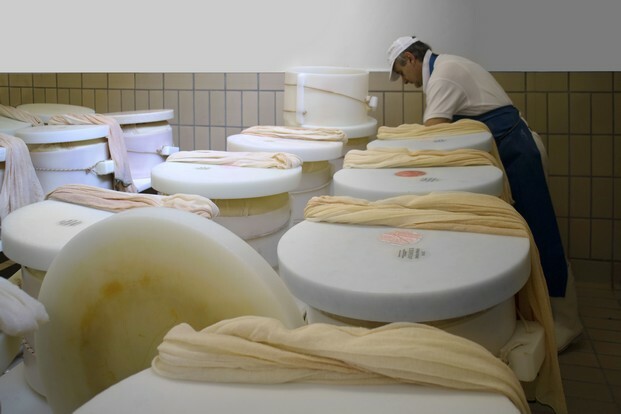 Over the years, with growing health restrictions and the requirement to perform many more analytical tests on the raw materials, the dairy decided to close the feed mill and concentrate every effort on the production of Grana Padano, which was marketed and sold in the dairy shop as well. It originally opened in the 70s, when it was run by the cheesemaker's wife, while today it has become a real food store, managed by Marco and Nicola, who greet us from behind an incredibly well-stocked food counter. 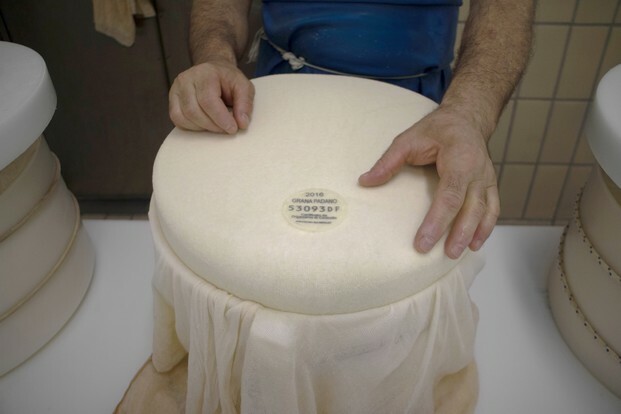 There is Grana Padano at every ageing stage, including “Tosello”, which comes from the freshly made Grana Padano, has a rubbery texture and really tastes of milk! There are also all sorts of other cheeses, as well as cured meats and meat cuts skilfully prepared by these young men and ready to be cooked. They are very dedicated to their shop and especially to the cheese, so much so that in 2008 they took a course organized by ONAF, Italy's National Organization of Cheese Tasters, so as to be able to select only the best products for their customers. This means that customers “Come into the shop as customers and leave as friends,” as Marco and Nicola are real characters. One of their customers has even written a rhyming poem about them in Mantua dialect, and that says it all! We have written it below in the original dialect with the English translation beside it. al serv par dismengar en qual magon. Which helps you to forget about your problems. Ma anca perché l’e bon al formai. But also because the cheese is so good! It's hard to leave this dairy! Our thanks to everyone for their time, and for the passion and authenticity they have shown us.